PNR (Passenger Name Record) is a 10 digit number recorded on the top left corner of a ticket, when a passenger books a train ticket. It is the data generated by the CRS (Central Reservation System) with complete journey detail of the individuals. Using this number, you can check whether the ticket got confirmed or not. Travellers can check their PNR status on IRCTC site. Once you made a ticket booking online, you can check PNR to know its status. 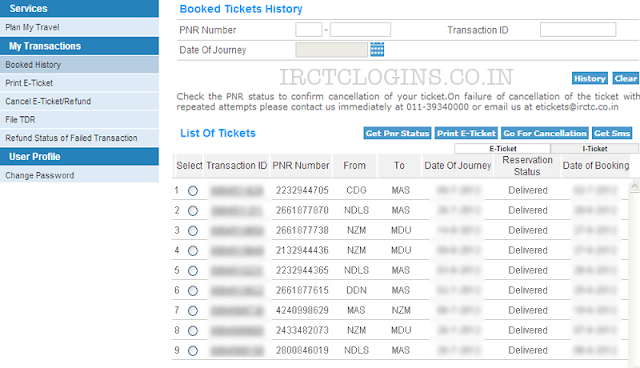 As IRCTC stores the transaction history in your IRCTC account, so there is no need to remember his/ her ticket PNR Number and it can be checked by just going through transaction booked history. Right now many options is going to be available to you. If you remember your ticket PNR number or Transaction ID or Date of Journey, you can check PNR status. The present PNR status of your ticket will be displayed on the screen. Apart from online, you can also check through SMS or Voice calling. Dial 139 from your landline or mobile phone and follow the instructions. After getting the PNR status, if the status is CNF, then your ticket is confirmed. Here's the list of some codes that you should know. RELEASEDTicket : Not Cancelled but Alternative Accommodation Provided.